Unlock for iPhone 3.1.3 on 05.12.01 baseband is here, but not in the ideal way you would have liked. 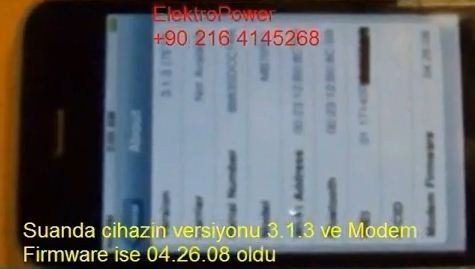 Some folks over at a Turkish shop have managed to successfully unlock an iPhone 3G, on OS 3.1.3, running 05.12.01 baseband via a hardware flash. They have also shot a 10 minutes video which shows the whole process of re-flashing the baseband back to 04.26.08. Video after the jump. Now if only someone in US or some other European country learns how to do this seamlessly with our locked phones on 05.12.01 baseband! UPDATE 1: Geohot has a working solution for iPhone 3.1.3 / 3.2 on the new baseband and bootrom. Here is a video of it in action. ready to buy a defect(05.12.01) Iphone…..
3.2 OS will be out in April, unlock and JB will be available soon. I think I'll keep my shiny paper-weight for the short time left…. hey im still able to use the wi-fi and the ipod…. It's nuts to do that to your phone without any professional tools and expertise. yeah… they need to really come up with a program like blacksnow or ultrasnow for 05.12.01…. hi, i’m from turkey and i’ve just called the the phone number given in video. Unfortunately they can unclock only iphone 3G, still can’t do anything on 3GS. The phone Flashing by itself and showing the Apple Logo and the “wheel of death”. There’s nothing I can do.. I put to DFU restore with stock 3.1.2 ( I am aware of 3.1.3 current problem that why I want to stay at 3.1.2 baseband 5.11.07) however Itune won’t let me restore saying not eligible for restore. It should be able to upgrade to 3.1.3 but that will lose all the JB and unlock… capability at this point what should I do? What are my option? Its forcing me upgrade to 3.1.3 but I haven’t done that.! I can't downgrade to 3.1.2 because I didn't save my SHSH key when I had 3.1.2 installed. 3gs 3.1.3 Cannot be unlocked.. thats the bottom line. No need to wait for those hacking softwares. they can not break it..
hi Kavin in which mode you jb the iphone on baseband 5.12.01? What is the difference between jailbreaking and unlocking? How do they differ ? i have found one place in montebello california that can fully unlock the 3gs on 3.1.3 with 05.12.01 f.w. but he charges alot so i found other places that have the unlock but are still waiting to use it to make sure nothing happens to your iphone like brick mode.. if you wait a couple of weeks and look on craigslist you will find someone to unlock it..
google downgrade 3.1.3 to 3.1.2 using shsh. of course this will only work if ur ecid is stored on cydia. Version: 3.1.3(7E18);Model: MB716LL;Modem Firmware: 05.12.01. Use quickpwn. Make sure you get the error message that says something like “cannot restore to firmware because it is not the current firmware” (basically an error message that says cannot downgrade). Then use quickpwn and it'll restore your phone back to 3.1.2. Or earlier if you want. Do you know how much the Montebello guy charges??? can u please help me in unlocking iphone 3.1.3 latest…on orange..
hay the new spirit jailbreak is out this will jailbreak your idevice but this is not an unlocking tool so it will not unlock the new baseband, if you are with your original carrier or your iPhone is originally on “Orange” from the day you got the iPhone, then there's no need to do the unlock, Just Jailbreak and free your iDevice. Hey guys how do you findout what baseband your iphone has? Mine was jus recently updated to the firmware 3.1.3 and it got locked again. Now i cant do anything on it. Its totally useless so how do i find out what baseware it has as of now? Hi, will you please help me. I need more info on how to do this. 1-Download Sn0wbreeze 3.1.3 or newer and the original iPhone OS 3.1.3 for your version of iPhone. Move all these files to your desktop. 2: Start Sn0wbreeze and select “Simple Mode”. 3:Sn0wbreeze will now ask you to browse for your .ipsw file. Select the correct 3.1.3 firmware .ipsw file by clicking the “Browse” button. Sn0wbreeze will verify the selected file and then will present you with following screen. 4:Click on “Yes” when Sn0wbreeze asks you “Do you want to activate your iPhone?” for hacktivation. Click on “No” only if you are on an officially supported carrier like AT&T. 5: Now you will have to restore your iPhone to this custom firmware 3.1.3 that you just cooked using Sn0wbreeze for your iPhone. Click on your phone from the sidebar in iTunes and then press and hold left “Shift” button on the keyboard and then click on “Restore” (Not “Update” or “Check for Update”) button in the iTunes and then release the “Shift” button. *Start “Cydia” on your iPhone. *Touch on “Manage” tab on the bottom. *Touch on “Edit” and then on “Add”. You will be prompted to enter a url source as seen in the screenshot below. Type “http://blackra1n.com” and touch on “Add Source”. *After installation is completed. Search for “blacksn0w” in Cydia and install this application. This app will automatically unlock your iPhone so that you can use it with any carrier. *Now simply restart your iPhone. Voila! You are now running a fully unlocked and jailbroken iPhone on firmware 3.1.3 on your iPhone 3G or 3GS. I used sprint to jailbreak works great.